NAPA, Calif. - When one thinks of the Napa area of Northern California, one word comes to mind - wine. The valley is known world wide for its celebrated wineries that produce some of the finest types of vino on the market. Even though the wine industry will always dominate the area, the sport of golf is slowly, but surely finding its niche in the community. 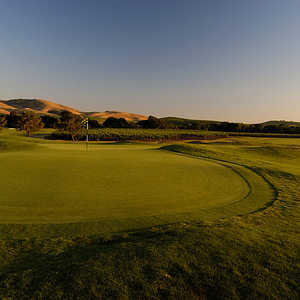 In addition to touring the wineries, tourists are making time for and enjoying the beautiful golf courses Napa offers. 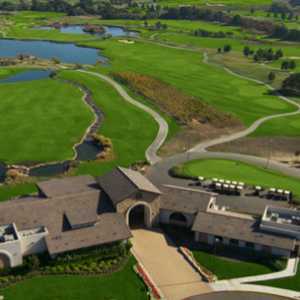 This includes the Napa Municipal Golf Course, perfectly set within the bounds of John F. Kennedy Memorial Park adjacent to the scenic Napa River. A hope, skip and jump away from the San Francisco Bay area, Napa has become a great weekend getaway. "What I find in a lot of tour groups is the men coming to go play golf and the women heading of to the wineries," said Napa Muni general manager Jennifer Bobbitt. As for the course, visitors will find it to be a challenge. This 18-hole layout is best known for its beautiful aesthetic look as well as its need for golf strategy. Water from the Napa River comes into play on 16 holes over the 6,370-yard, par 72 design. The course is rated 72.3 with a slope of 123 from the blue tees. Bobbitt says the course is a great balance between looks and challenge. "With the water coming into play, this can be a very challenging course," she said. "I'm a beginning golfer and I love to play this course because it's a lot of fun and beautiful." The course can be divided into two halves. The first nine goes through some scenic redwood oak while the lower half is your typical links style that follows the trail of the river. Golfers find play along the river to be soothing and relaxing, according to Bobbitt. But it's still a tough 18 holes. "It's hard for good players to play here," Bobbitt said. "The water makes you think and change a lot of your shots. This course is not forgiving." The course, situated on perfect rolling terrain, is also proud of the mature landscape on the front nine. 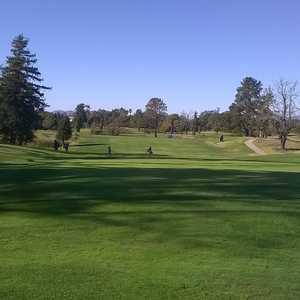 In fact, the early and finishing holes are surrounded by mature stands of pine and specimen Sequoia and oak. The course was constructed in 1958 by noted golf architect Jack Fleming. Probably the best part of this course is the reasonable green fees. For non-residents during the week, a round can be played for $23.50 while on weekends and holidays, 18 holes can be played for $27.50. You can also play the back nine for $9.25 during the week.